The New Multitec 4000 MK3 comes with a range of features for increased safety, user friendliness, efficiency and cost effectiveness. Designed in line with the high standards set by UK, European and international mine site operators, the Multitec 4000 builds on decades of experience in exploration drilling to provide a machine that is safe, easy to operate and offers excellent drilling control. Safety features include 3 emergency stops around the rig, an optional safety cage with automatic head speed reduction when open, optional radio remote control and an ergonomically designed control panel which provides the operator a good view of the borehole and quick access to all main components. Manufactured from high quality components, Dando rigs are designed for maximum productivity and longevity. With durability comes low routine maintenance and servicing costs which translate directly to a better bottom line for the customer. The rig is also easy to service with good access points to all main components. With a variety of rotary heads available the Multitec 4000 can perform wireline coring, rotary air blast, reverse circulation, Aircore, DTH and open hole mud rotary drilling with the kind of penetration rates you would expect from a much larger rig. High efficiency hydraulic systems with a range of small, powerful deck engines mean that running costs are kept to a minimum. 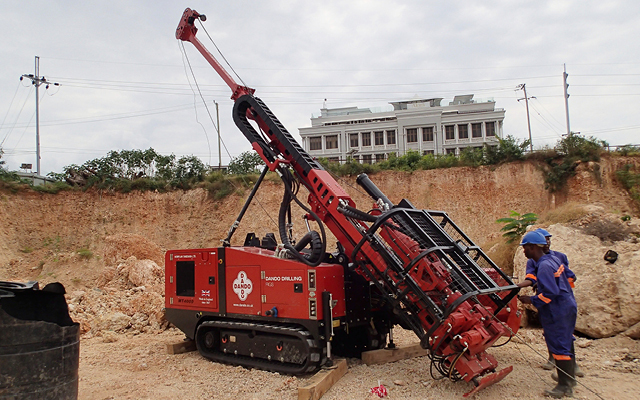 Designed for geotechnical, mineral exploration, water well and GSHP drilling applications, the Multitec 4000 is modular and customisable to your project. It can accommodate a range of engines, pumps, winches, carrier vehicles, and other ancillaries.